J.K. Rowling has given fans a glimpse of what makes one of her greatest villains: the Hogwarts professor and witch, Dolores Umbridge, tick. Dolores, former Senior Undersecretary to the Minister for Magic, was first encountered by readers in the fifth book in the magical series – ‘Harry Potter and the Order of the Phoenix’. The character was played in the film by actress Imelda Staunton. The 1,700 word essay which gave insights into the pink-loving, sweet-smiling, Defence Against the Dark Arts teacher was published on the author’s website pottermore.com to mark Halloween. The biography reveals a lot about Umbridge's villainous past and the biggest one being: she’s a half-blooded witch —the daughter of a wizard and a Muggle (a non magical person). This is particularly important because in the books Umbridge lies to establish her own pure-blood credentials and is cruel to non-magical humans. 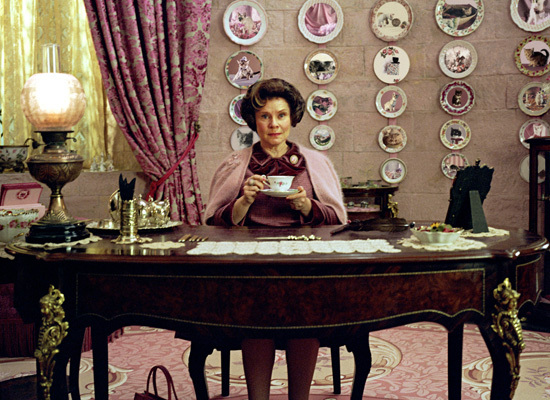 Imelda Staunton as Dolores Umbridge in the Harry Potter films. It was also revealed that the real-life inspiration behind Umbridge was someone Rowling disliked, though the author is careful not to reveal her identity. Rowling revealed her inspiration for the name, as Dolores means "sorrow" and Umbridge is a play on "umbrage", meaning offence. The author also writes that when Umbridge forced Harry, to cut the words “I must not tell lies” onto the back of his hand as part of his detention, she became the only person other than Lord Voldemort to leave a permanent physical scar on the boy wizard. Umbridge, eventually ended up being put on trial for co-operation with Lord Voldemort's regime, and convicted of the torture, imprisonment and deaths of many muggle (non-wizarding)- born witches and wizards. To access the piece on pottermore.com double click on the door, taking you through to the office. When you click on Umbridge you unlock the new writing. In addition to this new essay about Umbridge, Rowling has added a selection of background material to Pottermore for Halloween, to mark the launch of the fifth book in her Harry Potter series, ‘Order of the Phoenix’, on the website. The new entries include details about the creatures Thestrals, the history of the wizarding prison Azkaban, Rowling’s thoughts on professor Sybil Trelawney and an introduction to the wizarding practice of Naming Seers.